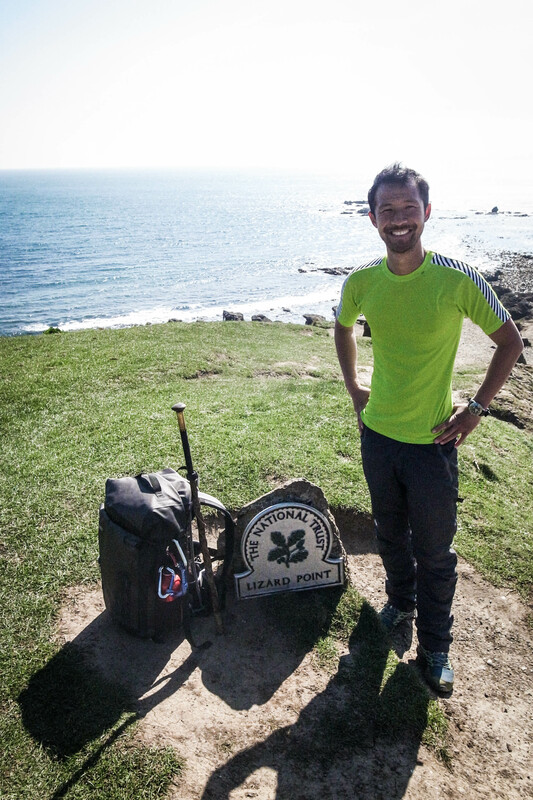 A walk around Britain, writing a sonnet a day. The time nears. The book will be launched alongside the latest collections from other Eyewear poets, including the award-winning Maria Apichella, as well as Alice Anderson, Ben Parker and Terese Svoboda. All are welcome. If you’re in London on Tuesday 4 October, please do feel free to drop by The London Review of Books Bookshop, on Bury Place in Bloomsbury, at 7pm. Many thanks, as ever, and hope to see you at the launch. Hope that you’ll be following. So the first copies of the book have been printed and bound. After some months of electronic proofs, I am quietly happy to see the book in physical form and to know that I can now literally ‘throw the book at someone’. Although, the official publication date for the book is not until October 2016, preview copies are now available from Eyewear (you’ll need to email the press). I admit, it’s a nice feeling to see my name on this poster. 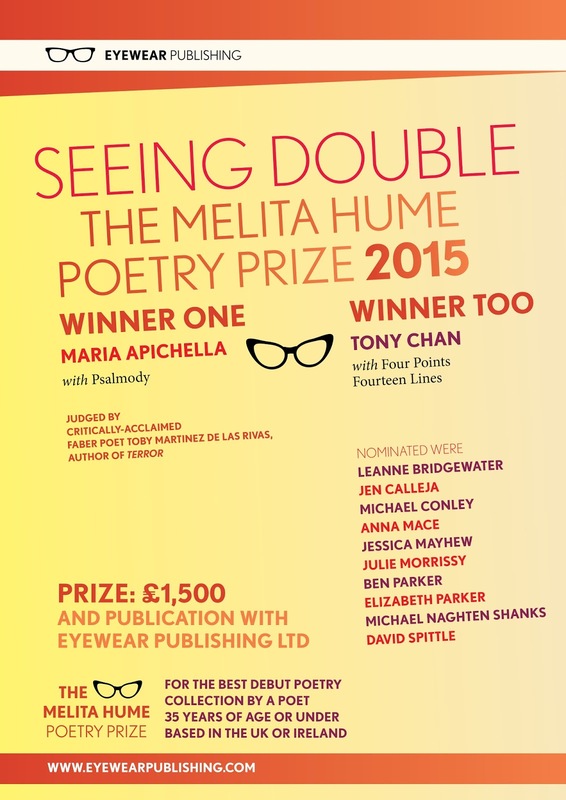 So, I find myself as joint-winner of the 2015 Melita Hume Poetry Prize with Maria Apichella. I am delighted beyond more descriptive words, and excited that my collection of poems will now be published as a book, by Eyewear, in 2016. Tony has reached into the past and brought us a new way of seeing an old, familiar form […] Looking back over my notes as I was reading the collection, I find the following: ‘Supremely generous’, ‘At times, technically brilliant’, ‘A clever mix of overblown Romantic structures with a self-deprecating tone which is very attractive’. It is undoubtedly not perfect – he often writes in full rhyme, and iambic pentameter […] but that slight unevenness is all part of the fun, part of the hugely generous vision, the willingness to push on, which makes this collection ultimately so rewarding and enjoyable. I am most grateful to Eyewear Publishing and its director, Todd Swift, for all the support through the judging process and through the months to come as the book moves towards publication; to Toby Martinez de las Rivas, for his benign and encouraging consideration of my work; and of course and as ever, to all of you for your continuing readership, encouragement and dream-making. Over the years, I have often offered Shakespeare’s counsel, ‘Things won are done; joy’s soul lies in the doing’. I continue to draw much happiness from all that has resulted from this creative project and look forward to doing more. I hope that you are encouraged to pick up a pen, and to try doing some poetry of your own. Fri 1 May: Vanity of vanities! My name sandwiched between 11 others. If there might ever be a time for some vanity, mixed in with some self-promotion and self-aggrandisement, this may well be it. In short, the collection of poems produced during this walk has been selected in the Shortlist for the 2015 Melita Hume Poetry Prize. The prize is offered for the best debut full collection by a poet under the age of 35. 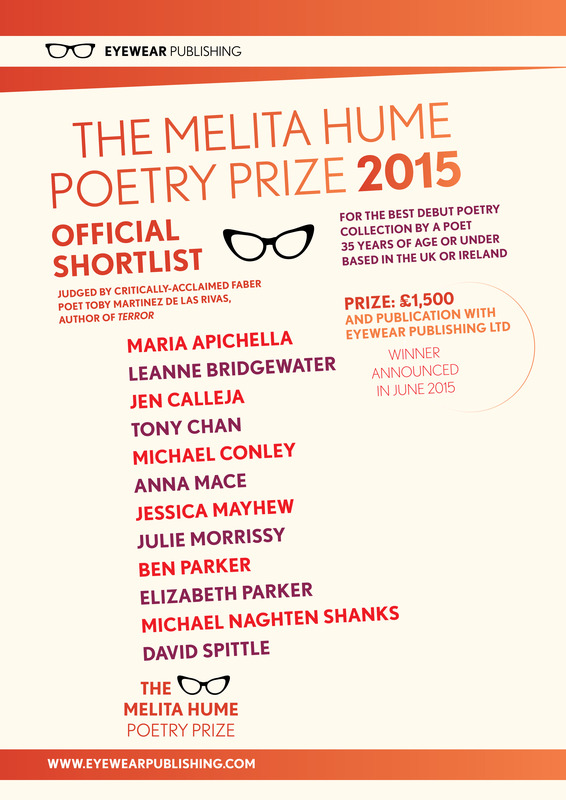 If you wish, you can read the announcement of the shortlist on the Eyewear blog, here. Also, you can read more details about the prize on the Eyewear website, here. As the final judging has begun, it has been necessary to remove all of the poems from the public domain: I apologise that both returning and new visitors to this website are no longer able to view all of the poems (written between January 3 and March 21). Who would have thought that my 78 poems would receive even a semblance of critical appreciation? When the longlist of 20 was announced a fortnight ago, I thought myself fortunate. Now, with news of this shortlist, I’m thinking very fortunate. Regardless, nothing would have been made possible without the ever-present encouragement from many of you through the journey itself, astute counsel in the planning phase, and supportive friendship and love as I have returned and settled back into the normalities of life. Thank you, as ever and most sincerely. Well, I’m back onto motorised transport and I have a motion-induced headache. This walk has been such an intense and substantial part of my life over the past few months that settling back into society is probably not going to be completely straightforward. Still, I’m very glad to have taken on the project and to have completed it. As you might expect, I have dozens of stories that I should hope to share with you one day, and have taken a great deal of perspective and adventure out of the entire experience – next time that I drive a car, I shall definitely slow down as I pass a walker! For those of you who are interested: here is the map of my route. You can also view the complete route and distance chart, in miles and in kilometres. As for what waits ahead, I really do not know. 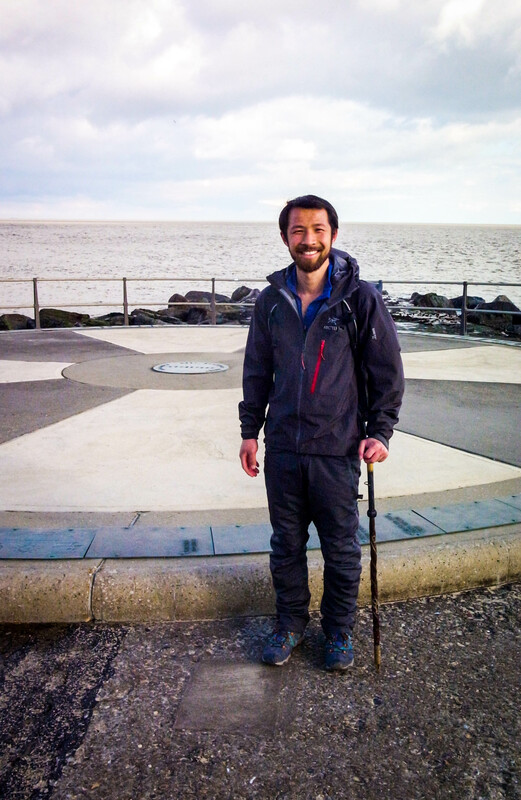 I’m inclined to take on another walk-and-write project, following the Via Francigena from Canterbury to Rome; but perhaps I have walked enough in recent days. We’ll see where life leads. I am always happy to hear from anyone, and equally happy to answer any questions. My contact details remain as published. One last time, thank you, for all of your messages, emails, calls and prayers of encouragement; they were so very uplifting at the end of each day’s walk. Now seems an apt time for me to deploy Marlowe’s neat phrase: terminat hora diem, terminat auctor opus. 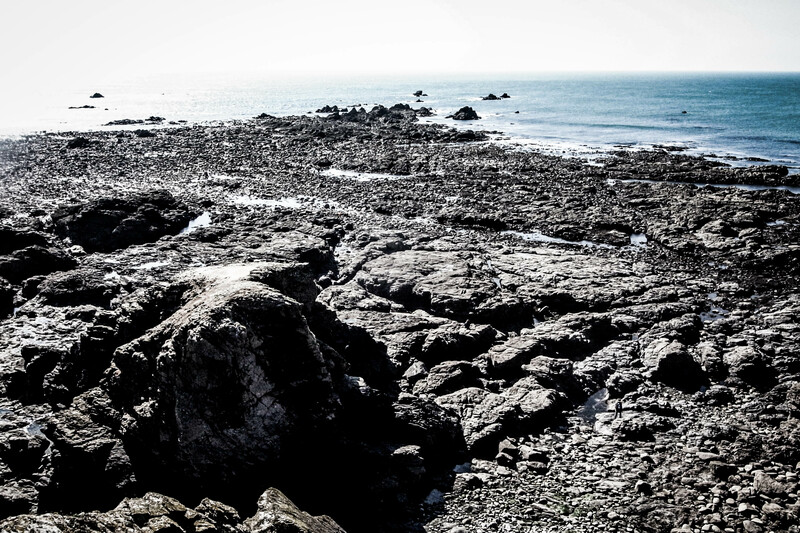 The extreme four points of mainland Britain. 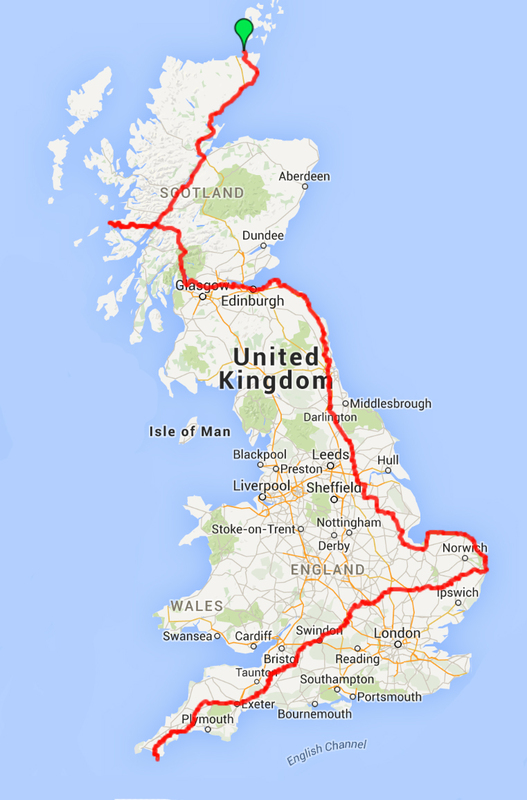 Have walked the length and breadth of the country. What, you ask, has been the greatest lesson? Is unquestionably, ‘To be’. To be. Thank you, sincerely, for your kind reading. Note: How co-incidental that I complete this walk/project on World Poetry Day. A final postcard image. 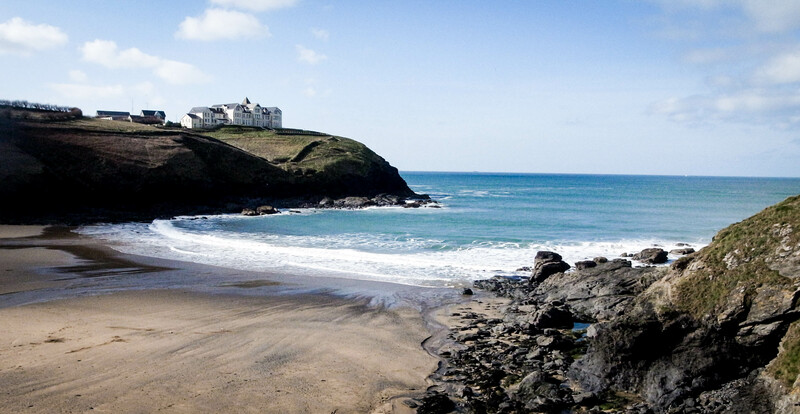 Here, Poldhu Cove, overlooked by the Poldhu Care Home (a scene which, to me, is reminiscent of Newport’s mansions). The entire collection of poems from this project was published by Eyewear in 2016. Only a sample of the 78 poems remain accessible on this website. Full of what were once somebody’s treasures. Cast off chattels revamped as Veblen goods. Early afternoon at Ness Point, Lowestoft. Two details from the Euroscope. 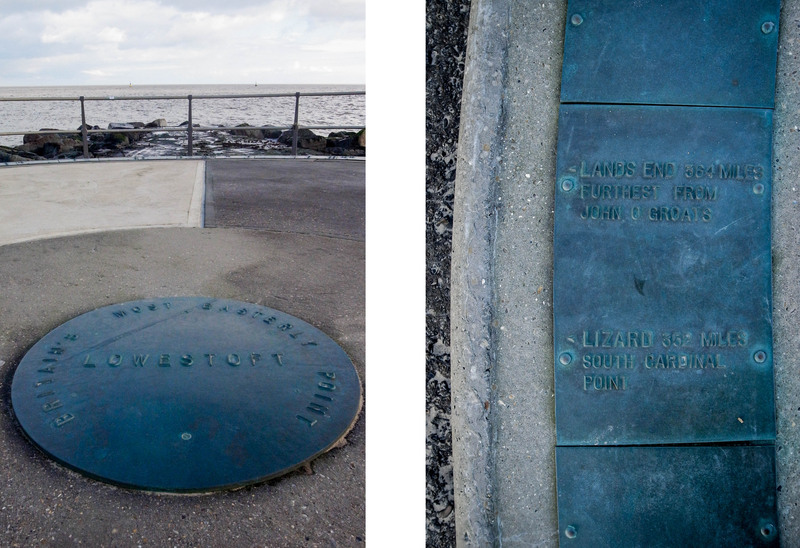 On the left is the central marker; on the right, a nice reminder of what still lies ahead. For a Western start in Australia. And sought the stars from Oz to Albion. The way that I have wandered since my birth. Drawn towards sunset and my journey’s end. A bonus photograph. Just across the River Yare from Great Yarmouth is Gorleston Beach, a most pleasant place to spend a sunny Saturday morning. A flock of oystercatchers at Huntstanton Beach. With the one query always asked of me. Is this how our world now lessens our hearts? Auspices of goodwill and fundraising? Innards slowly seeping new asphalt stains. And thus they came to face their fall and fate. Saved by my lane-leap and verge-hop scurry. What good is sapiens in a carcass? Sadly, no ‘Westernmost Point’ marker. Also, no one around to take my photograph so you get a ‘selfie’ and some stylised shots. With its Magi heroes, Monk and Monkey. At journey’s end, there is only one choice. Regret, not compass, dictates direction. Alongside all that I once wished to find. Eastward I walk, in prayerful oblation. Some bonus photographs: here are a couple taken on the road between Kilchoan and Ardnamurchan Point. More bonus photographs: here are a couple taken on the same road, a part of my ‘Animal Family Portraits’ series (joking!). Path and light are caught in conjugal kiss. One foot works, then the other of the pair. It is all too easy to move forward. Feet stamping forward yet against my mind. Valued fragments of life lived, left behind. Greetings from Inverness. It is 10.15am and I am writing from a golden aches café, which is one of the few establishments open here on New Year’s Day. It is my first visit to McDonald’s in many months – but I suppose that I am about to embark on a project which will involve many firsts. 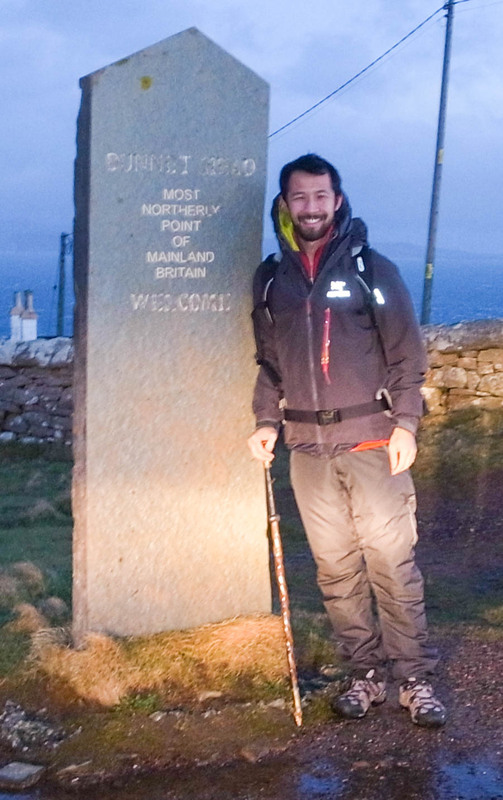 Over the past week, I have slowly made my way north; I reach Thurso tomorrow evening and I set off from Dunnet Head on Saturday 3 January. In terms of weather, it is pleasantly temperate in the Highlands. On the 3rd, sunrise at Dunnet Head is due at 9.01am and sunset at 3.32pm. As I am walking south over the course of the next few months, and as the solstice has passed, it ought to be quite a good feeling to see more and more hours of sunlight each day. A new year, a new venture: a 2015AD venture. There has been a lot of interest in this website over the past week: thank you for your curiosity and encouragement. I am sorry that there are not more frequent updates, but really, there is not much to report until the walk begins in the first week of January. No one needs to be bored by postings charting the minutiae of preparations. I wish to make clear that this is not a website set up with the intention of publicising my project: the website is simply a mechanism to hold me firm in my commitment to write a sonnet a day. Yesterday, I wrote a sonnet for the first time in many years. I regret that I cannot publish it in this post, as it was a poem written in private thanks to a good friend. It confirmed that I can indeed wring and wrangle 14 lines of text into less-than-accomplished poetry. Yet, I was happy when I completed the poem, and even happier whilst engaged in the process of composition. We shall see how long my enthusiasm for forming poetry will last. I find myself in the last days of my employment. Come Thursday, my career as a teacher, a life which I have known for the past eight years, will be done. The experience which I have known every day as the present is slipping spectrally into a past: my past. As for what waits ahead? There is doubt, certainly. Yet I am happy to be doubtful about things because if I wasn’t a little fearful of what lies ahead then I don’t think that the whole thing would be worth doing. There is something about the unknown – of place, of experience, of spirit – which promises to mark the distinction between that which is ordinary and that which is different. Once work is done, I shall have the time to look more carefully at arranging my travel up to Dunnet Head, to buy a last few bits of essential kit (some waterproof gloves and a tougher outer layer have been new additions this week), and to take on some walking practice. I feel that Brighton-to-London, or Canterbury-to-London might offer a suitable warm-up. I have spent much of the past couple of weeks both literally and figuratively gearing up for this little ramble through Britain. I have sought the advice of friends much more skilled in mountaineering than I am, and they have zealously motor-mouthed lists of technical equipment and names of synthetic fabrics, all of which might stand to serve some overly-specialised function. And as ever in the free market, this one does something better but that one does another thing best – yet both pale in comparison to the other one which does whatnot. Also, as things start to take shape, the immense difficulty of walking through Scotland in Winter has become very clear [sub ‘difficulty’ for ‘stupidity’]. Even though I’m hopeful of finding accommodation on each night of my walk, the weather is so unpredictable that it makes much sense to make plans for emergencies [sub ’emergencies’ for ‘my poor navigation’]. So amongst my most happy purchases over the past fortnight have been: a completely waterproof backpack, a pop-up emergency survival shelter, and a mountain rescue approved survival tube. I’m not quite sure how or when to deploy these last couple of acquisitions, but I think that something about the word survival was attractive. Well, here is the first post. Having considered the idea for this project through plenteous permutations over the past months, and after some more serious development work over the last fortnight, I am now fully committed to this project. I am certain that I don’t entirely comprehend the enormity of whatever behemoth adventure lies ahead; all that I do know is that I have managed to clear away the obligations of my life and now have a dreamer’s capacity of time, finances and hopefulness. I have been much emboldened by prayer, the earnest words offered by good friends, and a copy of Ben Okri’s short essay, While the World Sleeps, encountered entirely by chance (you can read all three parts here). I’m presently working towards a provisional departure date of January 1, 2015. However, bearing in mind the logistical difficulties of getting up to Dunnet Head around the New Year festivities, a start date of January 3 or 4 is more likely. This would mean a finish around mid-April. Now begin the processes of rough route-planning and gear-shopping. I have a waterproof top, but I suspect that full-body coverage would be wise for a long Winter walk, as well as some thick insulation layers. Expect some intermittent updates over the coming weeks, and then (internet access permitting) daily postings once the walk is underway. Thank you – the first of many, I am sure – for all of your interest and encouragement.